- Matching lugged crown CrMo steel fork included. Features low-rider pannier mounts. 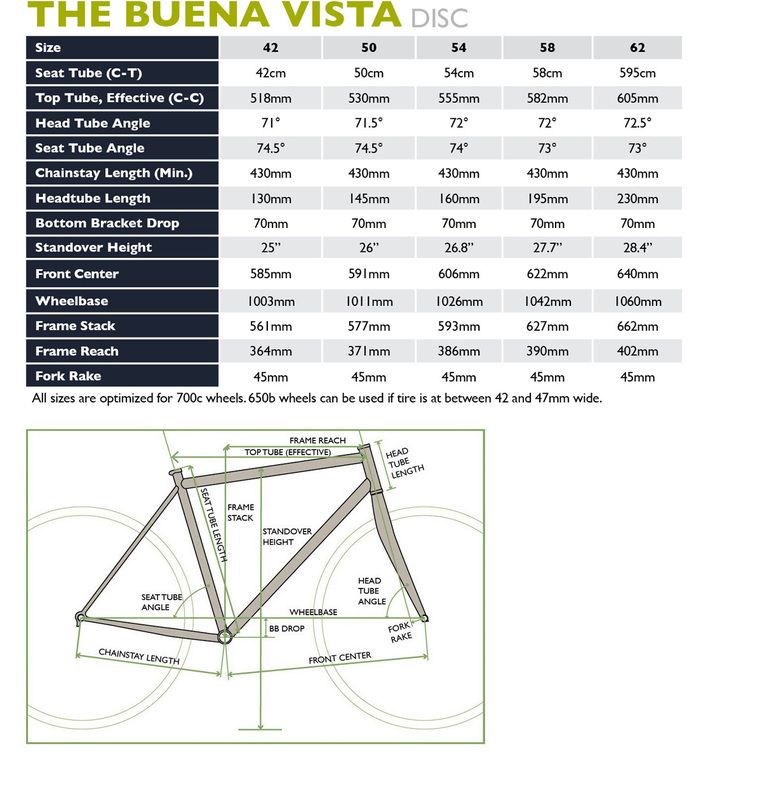 Why should I get a Buena Vista Disc instead of finding a vintage mixte on Craig's List or buying one of the cheaper new mixte bikes I've seen on the internet? First off we are happy you are looking for a bike, any bike. Just make sure it suits your needs and fits your body. Advantage over new cheaper mixtes: 1.) Materials on competitor's bikess may be cheaper, might be high tensile steel or plain gauge CrMo, which makes it heavier to take upstairs. And won't absorb road vibrations as well. With Soma you get name-brand CrMo tubing. 2) Sporty geometry: Most complete mixtes are design for upright cruising in the park or for short commutes. You can't ride them very fast. Your body will be in an awkward position when standing up to climb hills. The Buena Vista can be built up as a comfy cruiser, too, but its longer top tube allows you to also build it up like a road sport bike or hybrid. The bike shop can tune it to your body and flexibility. 3) Also we offer 5 sizes. Others mixte bikes are usually offered in one or two sizes only. What are some reasons of getting a mixte ("mix-tee") over a regular "double diamond" frame? 1) It has a lower standover height than a regular road or hybrid bike, which allows you get on and get off the bike in the front of the seat, which has its advantages. Example: You are carrying a trunk bag or baby carrier on the rear rack and you don't want swing your leg over the seat and accidentally kick your baby. Also you can more easily straddle the bike when you are stopped at a light. And it's easier to share with shorter or less experienced friends and relatives. Older riders with less flexibility may find the mixte easier to mount and dismount. It is also easier to ride a mixte in a longish winter coat. 2) Style: Some who like these bikes like it for its vintage styling. Before we launched our Buena Vista, both men and women in our city were scouring garage sales for these charming style of bike. 3) Less likely to hurt the family jewels in an accident.